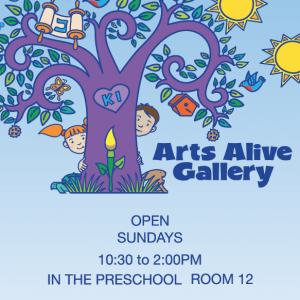 The Arts Alive Gallery, a joint project of the pre-school and the Temple Judea Museum, is an artist-run, professional exhibition space. Members of the museum’s Artists’ Collaborative are key movers in this wonderful, kid-centered, unique arts project. Like any other gallery there are exhibitions, openings and receptions. However, a gallery in a pre-school is unique. Special kid-centered activities focus on making the world of the visual arts accessible and meaningful to very young children. Artists meet with the children three times. They introduce the work on display and talk about it with the children. They lead a hands on studio workshop, and a final reception and display (for parents, artists and kids) includes work by both the children and the artist in residence. “The Arts Alive Gallery” permanent collection includes the work of the late, respected artist and community icon, Mili Dunn Weiss. In her memory her family presented “Arts Alive” with a significant collection of Mili’s work. The gift includes her inspirational collections of antique musical instruments, extraordinary shells, and dolls from foreign lands. These collections, along with art historical reproductions designed for classroom use are an added valuable resource. The collection is further enriched by a gift of photographs by prize winning photographer, Stan Singer. Our children learn new vocabulary, meet adult artists, have the opportunity to model creative behaviors, work with unusual art materials and improve conversational skills.